The assumption has to be made here that the reader understands how to play poker games. 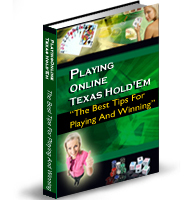 Plus, to be successful knowing how to play online poker means that you must know the basics. Poker is a lot easier on the mind and heart when you happen to be one of those individuals who always seems to be lucky, but you must believe that the top poker pros are winning consistently because they know how tread the cards before o play poker online. Any experienced player will tell you that to be successful is going to call upon all the skill you can muster along with all the strategy you can create as well as learning how to read the cards before you. * High card there are four suits with an equal number of cards right from the lowest at two up to the highest which is the Ace. Knowing which court in your hand is the highest is very important when it comes to such activities as a showdown. Is an example where two players have a pair of Jacks each. One player has a 7, 8 and a 10 as well the other player has a King, 4 and a 2. This player has a pair of Jacks but the King kicker. His hand beats the other one because that player only has a 10 because his kicker; the King is higher than the 10. Also, although it doesn’t happen often, a hand with a high card can win a round when no one has at least a pair. * One Pair this is to cards of the same number right along with three cards having no connection to the others. An example would be having a hand where there are 7 7 54 2. his hand represents a pair of 7s with a 5 kicker. * Three of a Kind is a good poker hands ranking since the odds of getting three cards of the same number ranking are less than the above. An example would be 5 5 5 2 K. A kicker is not applicable with this gun and since no one could match the 5s. * Straight is five cards winding up in sequential order. For example, 6 7 8 9 10. Suit does not matter in a straight, however if you’re straight is all the same suit, then it is a much stronger hand called a straight flush. The strength of a straight is based on the top card, keeping in mind that 2 is at the week end. * Flush is five cards of the same suit. These can be any five cards and do not have to be in order, which would be the referenced above straight flush. However, if two players have a flush of each, the one with the highest card would win the hand. * Full house is three cards of the same value accompanied by a pair. The three card value will determine the hands strength. For example, 8 8 8 4 4 beats 7 7 7 4 4. * Four of a kind is four cards with the same value plus any other card. Remember Ace is the strongest. * Straight flush is five sequential cards of the same suit as described above. However, the strongest and best possible when it comes to poker hands order is known as a Royal flush with Ace as the high card flowing down to a 10. If you learn how to play online poker, you might come up with that winning Royal Flush when you know the basics of poker hand rankings.